A leading retailer of prime luxury cottage homes for sale, Platinum Cottages has earned an enviable reputation for superb products and exemplary customer service. Grand Lake Platinum Cottages is proud to represent Platinum Cottages’ as the Oklahoma dealer for the industry leader’s Signature Series cottages. Owned and operated by Dianna McIntyre and her sons, Carl Fourier and Jedidiah Rahi, Grand Lake Platinum Cottages is located at Grand Lake RV Resort, which was voted the No. 1 RV resort on Grand Lake in the “Best of the Best” contest. 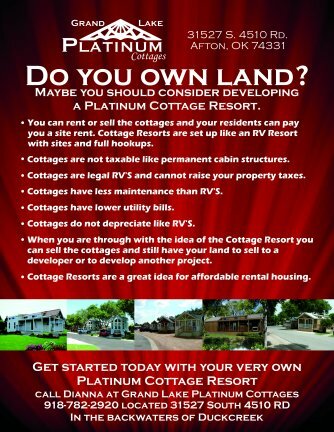 Grand Lake Platinum Cottages carries only the highest quality cottages — Platinum Cottages, which specializes in recreational living. There are 25 different models to choose from, all of which can be customized. From the most contemporary to the roughest rustic, the company has something to fit everyone’s style. Check out the Cottages page to look at some of the models and floor plans available. If you are considering purchasing a cottage, Grand Lake Platinum Cottages invites you to visit its Grand Lake RV Resort location and walk through all the featured display models. Grand Lake Platinum Cottages’ selection will let you see first-hand the fresh designs, uncompromising styling and first-rate craftsmanship that makes Platinum Cottages a leader in the industry. Choose from a cottage in stock and on display or customize a floor plan with options and decor choices to make it the perfect home for you.